Eclampsia is a rare but severe condition that occurs when pregnant women develop seizure without an underlying brain condition. It is usually referred as a condition called pre-eclampsia that occurs among women who are at least 20 weeks pregnant where hypertension occurs with the development of protein in the urine which is called proteinuria. Eclampsia can cause seizure even when a woman does not have any history of neurologic condition. Pre-eclampsia may develop at any time during the second half of pregnancy, but commonly occurs during the later stages. Although there are a lot of symptoms of pre-eclampsia, the hallmark symptoms are high blood pressure and protein in the urine. Pre-eclampsia can cause life-threatening effects that may involve vital organs in the body. Eclampsia can potentially occur when a pregnant woman experienced one or more episodes of seizure that may last 60 to 75 seconds. The face will initially be distorted with protrusion of the eyes and foaming of the mouth. 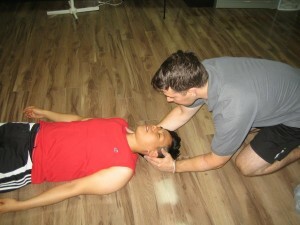 Respiration may also cease in which case immediate cardiopulmonary resuscitation should be administered. Pregnant women who are high risk to pre-eclampsia and eclampsia is at risk to more serious conditions. The potential development of kidney problems, liver and blood coagulation is high putting the fetus at risk to nutritional and oxygen deprivation that can result in the abnormal separation of the placenta and premature delivery of the baby. First aid management especially during seizure activity is very important to prevent physical injuries. During a seizure attack, make sure to protect the pregnant woman against hurting herself. Protect the head and the baby and make the person rests in a comfortable position after the attack. The person will feel a sudden weakness and giving a glass of water can help calm her down. If you think you are suffering from a pre-eclampsia, seek medical attention as soon as possible. MedlinePlus. Eclampsia. Retreived on July 1, 2014 from http://www.nlm.nih.gov/medlineplus/ency/article/000899.htm. Better Health Channel. Pregnancy-Pre-eclampsia. Retrieved on July 1, 2014 from http://www.betterhealth.vic.gov.au/bhcv2/bhcarticles.nsf/pages/Pregnancy_-_pre-eclampsia?open.